I always enjoy planning and packing my holiday wardrobe and this year is no exception. I’m going on holiday, a beach holiday, half-board to Nerja, Southern Spain tomorrow. We went to the same place last year so I have honed my packing to reflect what I wore, used, needed and didn’t need last year. While I never knowingly underpack, I don’t want to take so much that it doesn’t get worn, yet will still need washing and ironing upon my return, so whenever I go away, I take “outfits” which I’ve found to be the best way of ensuring that I’ve packed enough. (By that, I mean laying things out with shoes and accessories to ensure that the right tops go with bottoms and so on). With that being said, this year, I’m only taking dresses because they’re easier to accessorise and I find them to be much more comfortable than skirts and trousers in the heat and because they don’t have a waistband and the food at the hotel is out of this world! 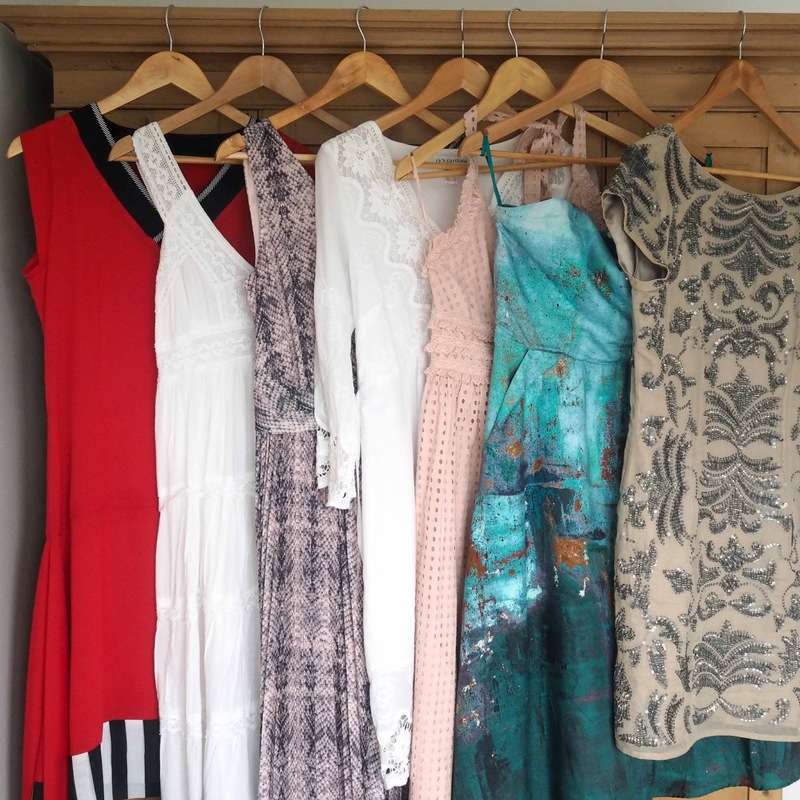 Although I have more than enough to take one dress to wear each day, they do only get worn for a few hours in the evenings, so can be worn on two occasions if necessary. I’m planning to buy one or two from the beautiful little shops in Nerja too, the white dress below being one such purchase last year. I love shoes of course, but I don’t want to pay excess baggage, so for my ten-day vacation, I have exercised great restraint and packed just five pairs. A pair of flip-flops to wear to the beach, a pair of flat espadrilles for travelling and sightseeing, two pairs of wedge-heeled espadrilles to wear to evening dinner and a slightly more formal pair of sparkly black sandals because they go beautifully with the red. black and white Lagom dress above. For the beach and pool, I’m taking three bikinis, (and will wear on rotation to minimise strap lines), plus a one-piece swimsuit. I’m going with my parents and my teenage children and we have a huge inflatable ring, which we take to the sea and take it in turns to clamber in and get pushed from person one to another, (my parents are very fit and love this). To avoid the potential of a wardrobe malfunction in front of the four people in the world whom it would most embarrass, I wear a one-piece. The one I’m taking is from last year. *Coral and white striped bandeau bikini, Dorina at Asos. A selection of cover-ups is essential for protecting the skin when the sun is at its hottest. 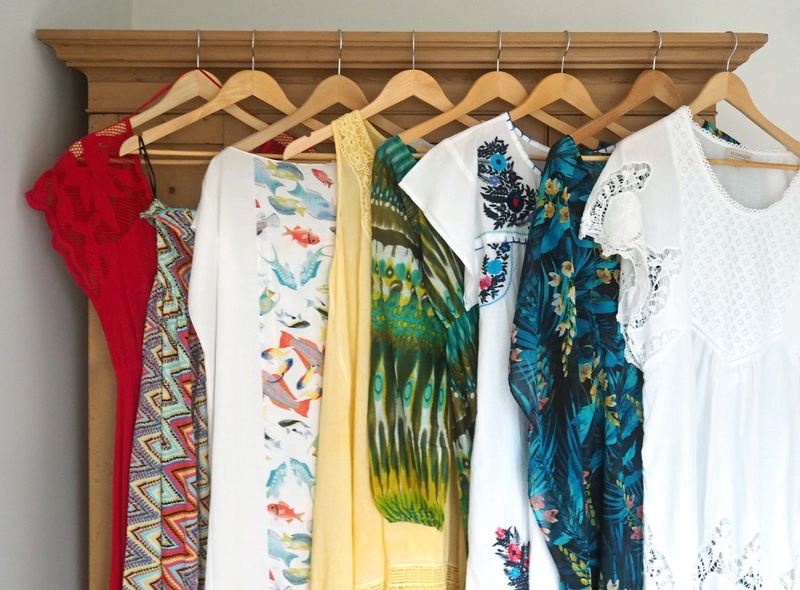 I like mine to multi-task so I take kaftans and beach dresses and wear them to breakfast and lunch over my swimwear. Last year, I found that I didn’t have enough. I take them off an on throughout the day so they can get a little crumpled. Although I don’t quite have enough to wear one each day, I do have eight, which should suffice. This yellow beach dress is now in its third year and I love it as much as when it was new. This was taken in Nerja last year. 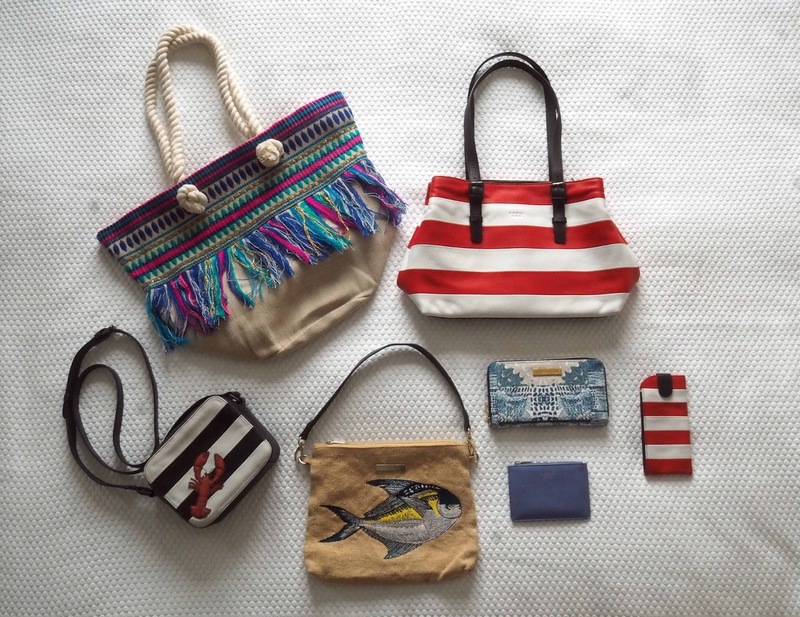 I’ll travel with this red and white striped shoulder bag because not only is it gorgeous, it has a central zipped compartment for travel documents and valuables and two more compartments for sunglasses, my make-up bag and everything else. I always make sure my beach bag has a zip, which can of course be left unzipped for convenience. This bright tasselled one is an ideal size and the straps are long enough to be worn on the shoulder too. For evening, I’ve got two smaller bags, both of which reflect my love of the sea. I always take two purses too, a larger one for the bulk of the foreign currency, credit cards etc which can be left in the safe and a smaller one for taking out with however much cash I need. I took a lot of jewellery last year and found that it was too warm to wear anything that was heavy or tight, so I’m taking a selection of wrap bracelets from my own range at Lizzy O, plus some lightweight pineapple and bee pieces from Danon, also from my boutique. 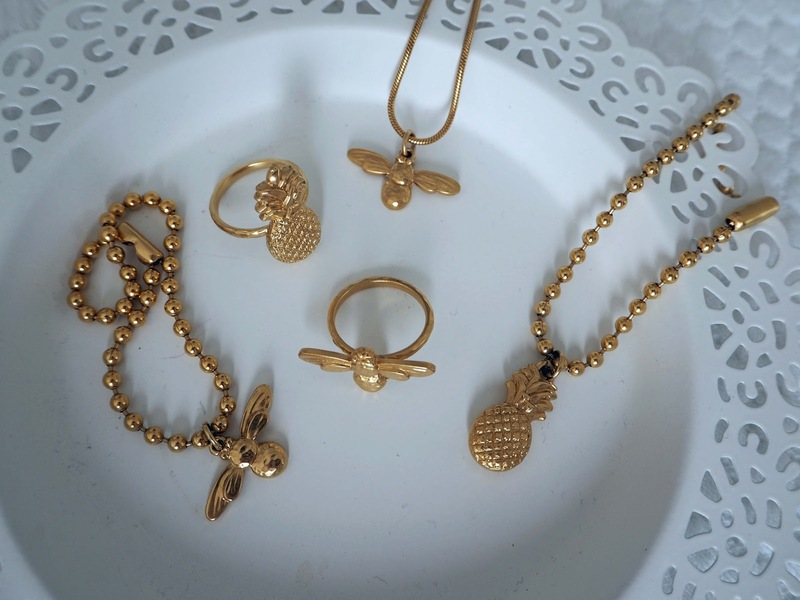 Mini honey bee necklace, £59, Honey bee ring in gold, £24, Honey bee bracelet in gold, £27, Pineapple bracelet in gold, £27, Pineapple ring in gold, £24, all by Danon at Lizzy O (All of this jewelley is available in silver and there are more matching items too). The leopard wrap bracelet compliments everything and if I were allowed to take only one thing, this would be it. It’s lightweight and super sparkly and looks fabulous in the sunshine. To ring the changes though, I have a selection of coloured diamante set wrap bracelets which I can layer and mix and match. (Sign up to my monthly newsletter here for exclusive subscriber discounts at Lizzy O). 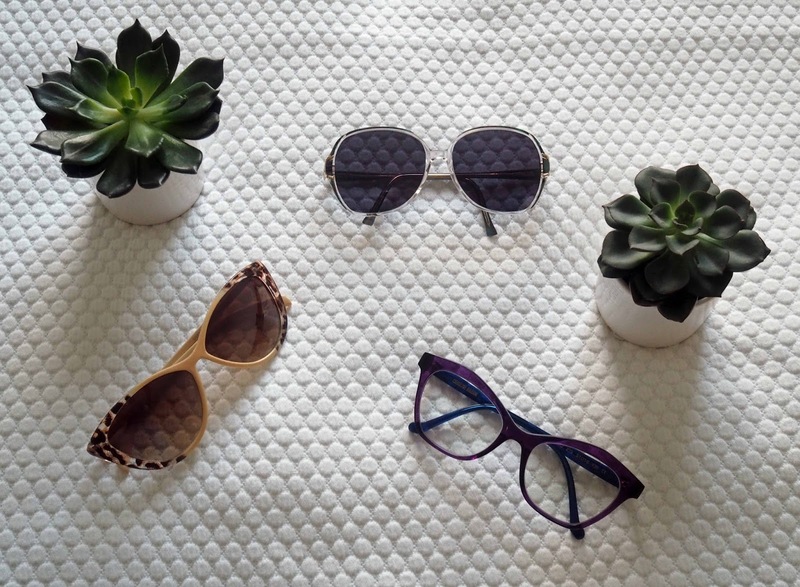 I’m taking three pairs of sunglasses, each very different. My Transitions Style Colours (clear in this picture) are the photochromic ones that you can read more about here. They’re brilliant for wearing when going in and out of doors because they darken in the sun and fade to clear when inside. The large roundish pair is from a fabulous brand called, rather ingeniously Retrospecced, who take vintage and used designer frames, refurbish and reglaze them and donate a percentage of their profits to the charity Vision Aid Oversees, a cause close to my heart. The third pair is a lightweight cats-eye shape with leopard detail. I keep them all in their rigid cases to protect them when in my suitcase, but use the beautiful soft leather case, (which matches my red and white handbag and can be seen above), when out and about. 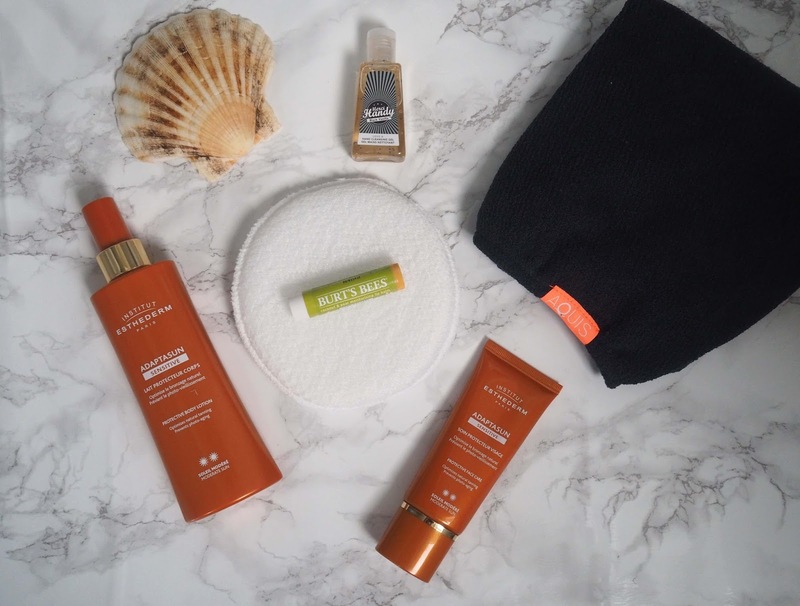 I take a lot of suncare products from various brands, but this year I’m trying some new premium ones from Insitut Estherderm, I shall report back on these because I’m always on the lookout for sun protection that is both effective and pleasant to use; it smells divine which is a good start! Along with my usual toiletries and skincare products, I’ve found a few things that are excellent additions for travelling including this Burts Bees lipbalm. My lips get incredibly dry, especially on the plane and this one is excellent. This Merci Handy anti-bacterial gel is nice and small for putting into my bag and smells lovely too. Neither a lotion or a potion but very useful indeed and something I use daily, is a microfibre turban. It helps to dry the hair and is lighter weight and cooler than wrapping a towel around. Finally, I love these scrubbers. I have several types that I use at home and I have deliberately saved this one for using in the shower for thorough removal of sand and suncream. It exfoliates too, so making a smoother base for tanning. 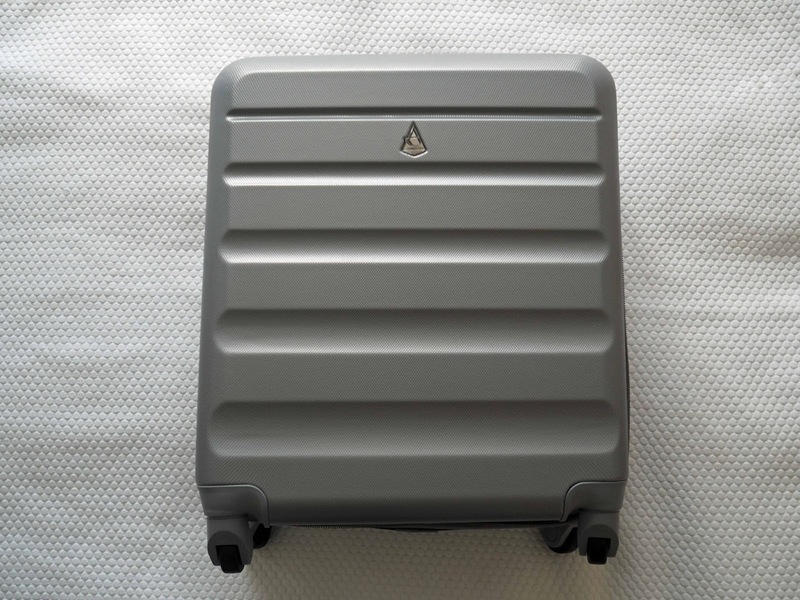 This hard-shelled suitcase is incredibly lightweight and is the maximum size that can be used as cabin baggage on Easyjet, British Airways, Jet2 and Monarch flights which is ideal for saving time collecting luggage from the carousel. 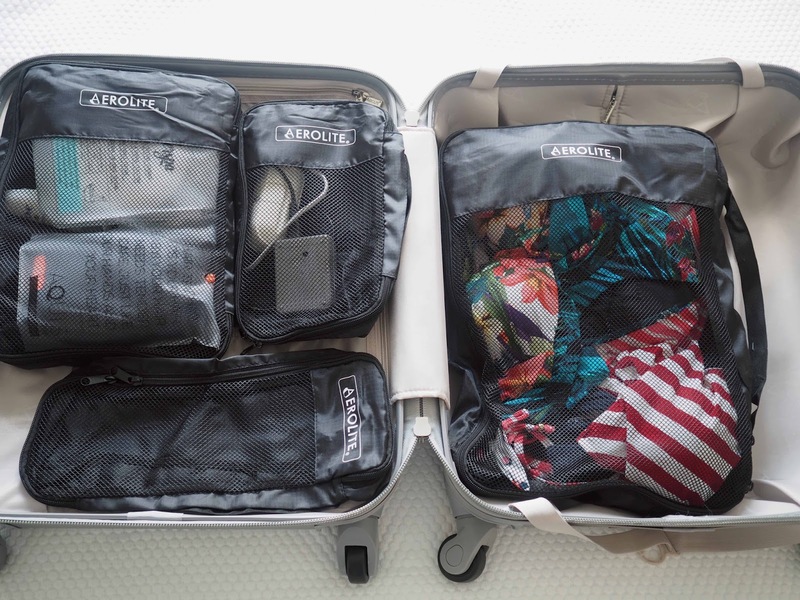 Because I’m going for ten days and have beach towels, shoes and suncream (in bottles larger than those permitted in hand-luggage), I’m taking another case to check in and will be using this for my swimwear, jewellery, sunglasses, camera and books. It’s from Travel Luggage and Cabin Baggage who have an excellent selection of baggage in all sizes along with a wide range of travel accessories. I always check the weight of all of our suitcases with a digital scale before we set off, because I’ve had the indignity of having to take things out of my case to put into one of the children’s at check-in, when mine was over the weight limit. 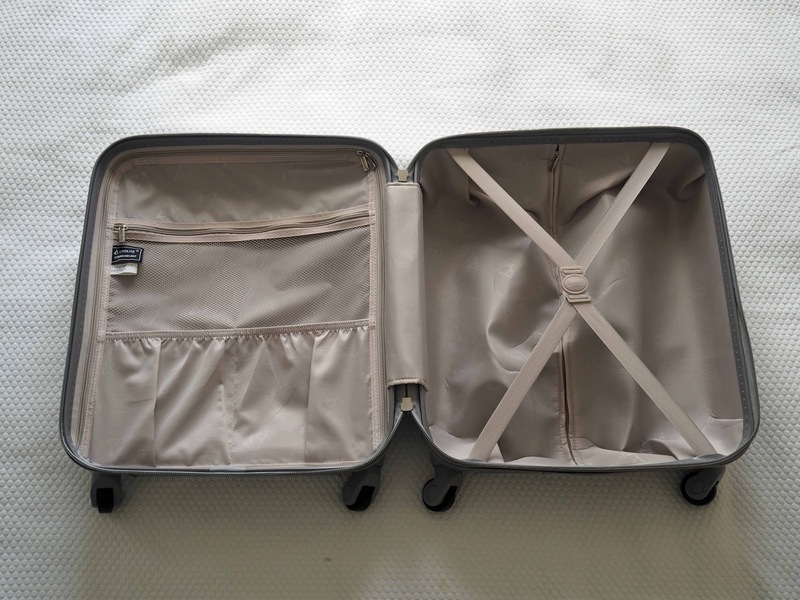 I’ve been using packing cubes for a while now when I travel. 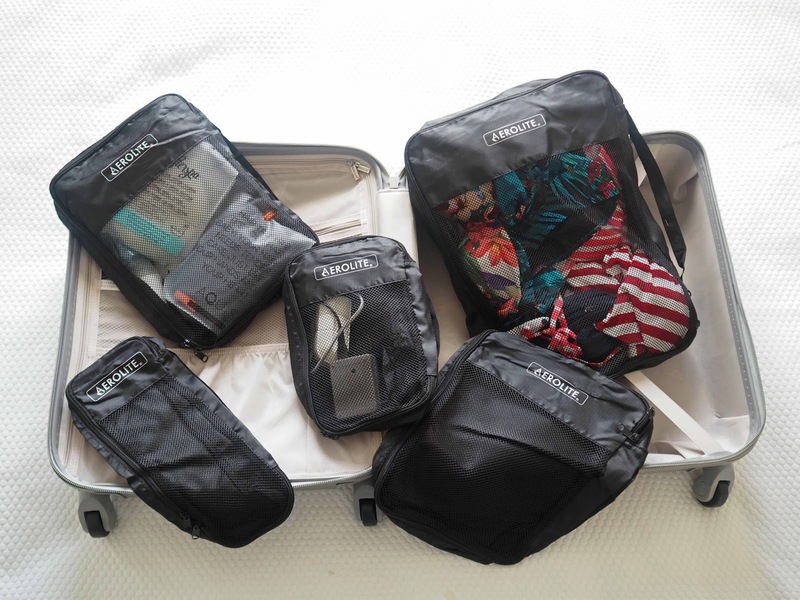 They are a brilliant way of separating lingerie, swimwear, toiletries etc and make the process of unpacking on arrival much quicker. They’re useful too for if you’re sharing a case or are on a multi-centred holiday. It’s only a short flight to Southern Spain, but my daughter always uses a travel pillow regardless of the duration of the journey. This one is particularly luxurious and comfortable and the more I touch it. the more I think I might use it myself, so comfortable is it. 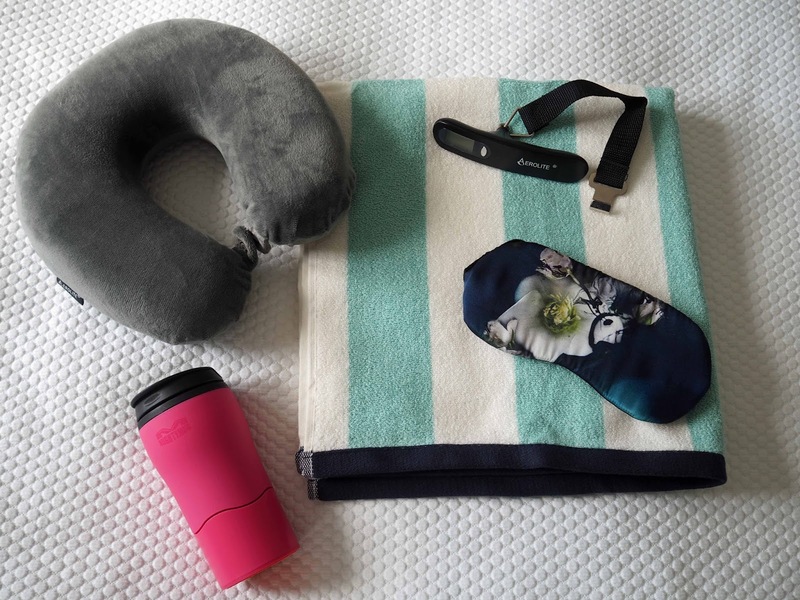 I love my silk sleep mask and although it won’t be needed on the flight, I do like to use mine every night. Beach towels aren’t always provided at hotels and even if they are, it’s nice to have one’s own to use too. Mine is new from M&S and I also got in a coral and white stripe too. It’s velour and is beautifully thick and soft. One last thing is my Mighty Mug! I’m driving to the airport in the early hours so this will have coffee in it. It’s insulated so keeps the contents cool or hot as required and it’s particularly useful for filling with water and taking to the beach without it getting warm (it’s awful when water in a plastic bottle gets warm). The other brilliant thing is that it cannot fall over; very useful when on the beach or by the pool. 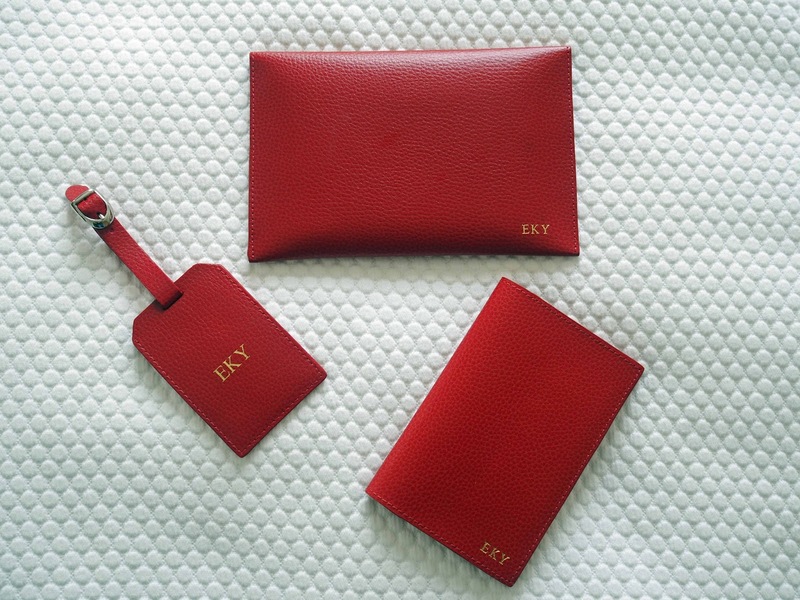 Non-essential travel items, but some little luxuries include my red leather monogrammed travel document wallet, passport holder and luggage tag which I love. I would love to see how beautiful Nerja is if you haven’t been. I’ll be sharing pictures of the town, the beach, the food and of my outfits on Instagram and Instagram Stories if you’d like to follow. Have a lovely two weeks and I’ll be back with some exciting new blog posts at the start of August. Previous Post Monkbar Hotel,York: Ideally Located for The Races, Shopping and Sightseeing. The cubes are a great idea! Enjoy your vacation (we call them holidays in the UK), and I hope your long flight from New York to Spain is a smooth one. It will be worthwhile! Please accept my sincere apologise Lizzy. I feel so foolish. What must you think of me! How organised is that! And yeah, I own that leopard bracelet! Andrea, andreaswellnessnotes, told once cthat she always takes a color theme, so that way all the clothes combine. I think that is a briliant tip! Your holiday wardrobe looks perfect Liz. Enough choice and variation that you'll look great on all occasions! I'm definitely someone who likes choice on holiday which sometimes/aways! makes me guilty of over packing. I've become much better since I make notes of what I actually wore on specific holidays, what I wish I'd brought with me and what stayed in the case! Take care …looking forward to hearing all about it and seeing your pics on Instagram. What a great post, Lizzy! You certainly are super organised. We never take summer holidays, only winter so I always have to pack bulky sweaters, jackets and boots but I'd love to, just once, be able to pack for a proper summer holiday lol. I guess living here in the sun makes it kind of pointless though! Thank you. I do like to be organised and unpacking everything yesterday was so much quicker than last year when I didn't have the packing cubes for example! And how lovely to have summer sun for a lot of your everyday life. I'm not going to say it must be like being on holiday permanently, because I know how hard you work but the warmth must help!!! I've only taken dresses too rather than skirts. I have a few shorts and harem trousers too though. I use packing cubes. Most useful for short trips when not so much is being taken. I find a long trip has too much for my cubes. I will follow some of these useful advice. Enjoy your holidays. You know how to pack girl and I love what you’re putting in your suitcase too. Looking forward to seeing more!